A Chick-Fil-A restaurant under construction near the Bangor Mall in Bangor. When is that Chick-Fil-A near the mall opening? We finally have an answer. The new Chick-Fil-A in Bangor on Stillwater Avenue is expected to open on Nov. 3, according to the company’s website. 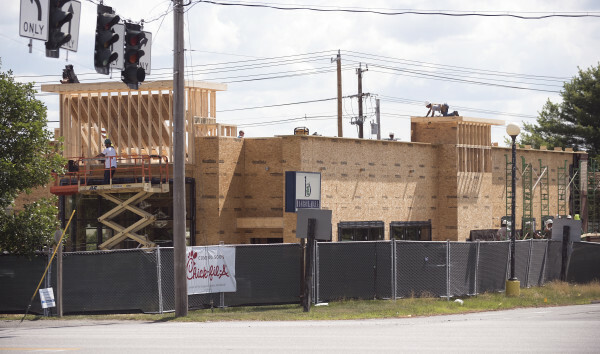 The company, known for its chicken sandwiches, nuggets and other chicken entrees, added the opening date to its future openings list this week, signaling the impending completion of its building at 663 Stillwater Avenue. The freestanding restaurant is located on the property of the Bangor Mall, and was announced more than a year ago. The site plan for the location was approved by the planning board in Bangor in January, and construction began in the spring. It’s progressed quickly over the last few months. The company is the top-selling chicken fast-food chain in the United States, according to BloombergBusiness, generating more than $5 billion in annual sales. It has nearly 2,000 locations in the United States, with new locations regularly opening. On Nov. 3, Bangor will be one of three locations expected to open. The other two are located in Sterling, VA, and Frisco, TX. The Bangor location will be the first Chick-Fil-A in Maine.